Olga sings softly while working in the field, stooped over and stuffing onion plants into small holes that were made a few minutes earlier by a tractor. She places two or three plants in a hole, sweeps in a little dirt, takes a step, and does it again. It takes her about three hours to fill a row 1,400 feet long. For this, she earns $32. She usually plants two rows a day. Olga wears a red bandanna to protect herself from the dust and pesticides that are kicked up whenever a tractor or truck passes by. She is, it appears, the only one of about thirty workers who is worried about it. Farm work is among the most difficult and dangerous jobs in the United States, consistently ranking as one of the three industries with the most accidents and injuries. It’s also one of the lowest-paying jobs. Most workers earn about $10,000 a year. In New York State, farm workers are excluded from rights guaranteed to most other workers, including the rights to overtime pay, a weekly day of rest, and collective bargaining. In spite of all of this, several million Mexicans work on U.S. farms—60,000 to 80,000 in western New York alone. More than half of these workers are here illegally. Until recently, the majority were young men. Now more women are working in the fields. The grinding poverty in rural Mexico is what’s driving people north in search of work. Slightly over 80 percent of those who live in rural Mexico earn less than $2 a day, and their situation is worsening. The cost of staples like rice, beans, and eggs has almost doubled in the past few years. The price of seeds and fertilizers has also risen. These trends are partly a consequence of the North American Free Trade Act (NAFTA) and other neoliberal economic policies, which have benefited large corporations at the expense of rural workers, or campesinos. These policies and rising food costs have driven an already impoverished population further into poverty and forced millions of people off their land to seek work elsewhere. Campesinos often supplemented their incomes at home by working a few months a year in Mexican cities or in the United States. Now, with little to return to in their villages, they’re staying away longer, sometimes permanently. This is especially true for those fortunate enough to have made it into the United States. Border security, tightened right after 9/11, has become even tighter over the past few years. There are more fences, more border agents; unmanned aircraft now patrol the border. A decade ago, men could slip back and forth across the border fairly easily. Now they’re afraid to return home because they know they may not get back in. This has left countless villages in rural Mexico with few able-bodied men. And now women are leaving their villages as well—married women who want to join their husbands in the United States and reunite their families, and single women who just want to escape poverty. 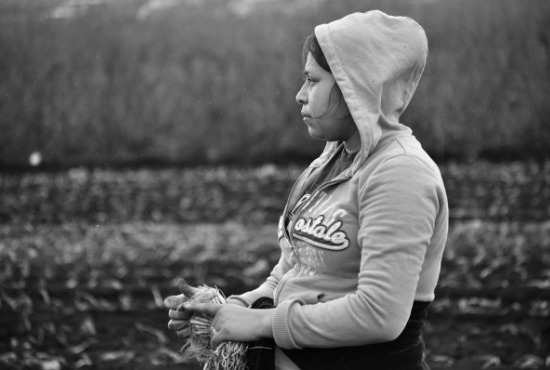 In 2007, the U.S. Department of Labor reported that 22 percent of farm workers nationwide were women. One farmer in New York told me that during planting season upward of 40 percent of his workers are women. In 2004, Carina Diaz Garcia was cooking and selling food on the streets of her hometown in the Mexican state of Morelos. She earned about $7 for thirty to thirty-five hours of work. She finally decided it was time to join her husband, who had been working on a farm in western New York for more than a year. Since she couldn’t enter the United States. legally, she paid a “coyote” $2,000 to smuggle her across the border. A campesino family is lucky to earn $2,000 in a year, so people like Carina must borrow the money for the trip or go into debt to the coyote. It took Carina a week to cross the desert; she and her group spent much of that time dodging the Border Patrol. Her trip was made even more difficult because she had her one-year-old son with her. She ran out of food and water after a few days and twisted her ankle, but she pressed on. “We passed people who were dead,” she told me. Having arrived safely, Carina found her new life to be nearly as difficult as the one she had left behind in Mexico. She lives on the first floor of a small farmhouse just outside Albion, New York. The apartment is sparsely furnished with worn furniture bought at thrift stores or left behind by previous tenants. Carina keeps the apartment clean, but it’s a bit chaotic, the result of having three young children and a brutal work schedule. During planting and harvesting seasons, her day begins around 5 a.m. “I get up, cook breakfast for my children and get them up at 6:10,” she said. “Then I prepare lunch. At 6:50, the two older ones go to school. I leave the younger one with a woman who puts her on a bus later. I leave for work at seven.” Depending on the time of year, Carina may work until six or seven at night, six or even seven days a week. Every type of farm work has its challenges. Raspberries are easy to pick, but they’re harvested during the hottest time of year. Still, the women with whom I spoke prefer picking raspberries to picking strawberries, which requires them to kneel all day, leaving them with sore backs and aching knees. Even tying up tomatoes, though not very strenuous, leaves one’s hands red, slightly swollen, and blistered. At the end of a workday, the women are exhausted and would like nothing more than to go straight to sleep. But they can’t because there’s more work for them to do at home. 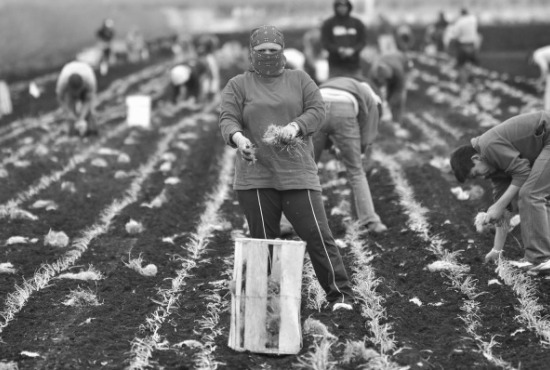 Life is hard for any farm worker, but it’s especially hard for undocumented workers. It’s a lot like house arrest. 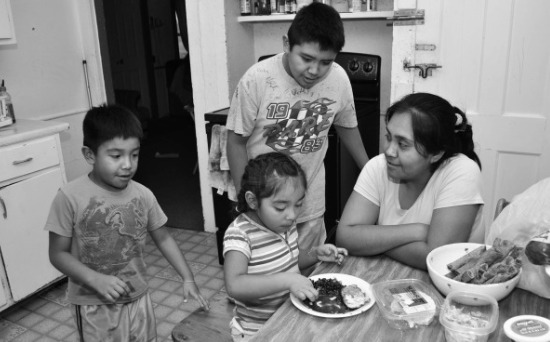 Ana lives in a small, crowded one-bedroom apartment with her husband and their three daughters. She and her husband have the bedroom; the tiny living room doubles as a bedroom for the girls. When it’s time to sleep, mattresses are dragged out and placed on the floor. Like most Mexican farm workers, Ana and her husband are here illegally and live in constant fear of being caught by the police or Immigration and Customs Enforcement (ICE) and deported. Not only would deportation end their chance of giving their daughters a better life here, it would hurt their extended families in Mexico, who depend on them for money. Ana estimates that she and her husband send their relatives in Mexico about a third of their income. Laura Gutierrez Lopez entered the country illegally in 2007. She wanted to earn enough money to build her parents a house in Mexico and then return home to open a store there. At first, she and her husband didn’t go out of the house unless it was absolutely necessary. Finally, they decided they didn’t want to live that way anymore and started to move around more freely. They paid for that freedom when Laura was stopped by police, who said her car registration had expired (she insists it hadn’t). The police then called the ICE, which discovered she was here illegally. 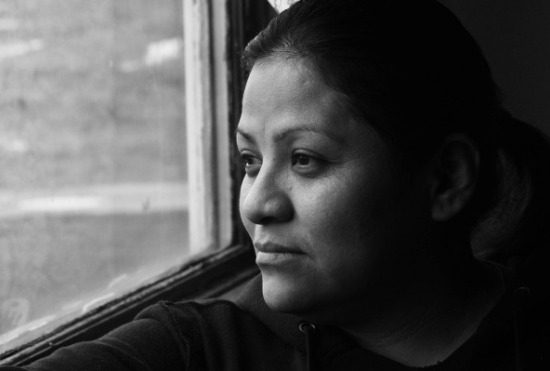 Laura, whose husband has already been deported, is still waiting to be deported herself. Until then, she’s enjoying her freedom. “Before, I couldn’t always shop when I wanted to, couldn’t go out if there were police or migración around. Now, if I want to shop, I go. Now I’m freer, much calmer.” She has even taken her children to amusement parks, something she never did before. Women like Ana and Carina and Laura endure a great deal—difficult jobs that few others want, a restricted life in a foreign and often unwelcoming country, a workday that never seems to end. Yet they do it. I asked the women I interviewed, “Vale la pena?”—“Is it worth it?” They all answered, “Yes.” And when I asked them why, they all had the same response: They wanted to give their children a chance at a better life. And so they go on working and saving and hiding from the ICE, whatever it takes to give their children something they themselves will never fully possess: a piece of the American Dream. The names of some of the women profiled in this article have been changed to protect their identities.